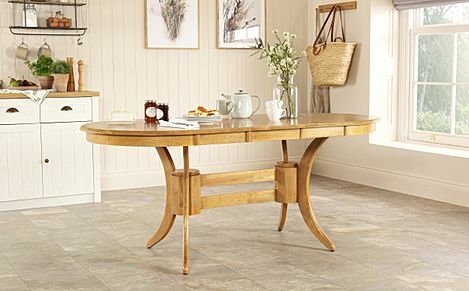 A classic oval dining table is a stylish and practical choice, we offer a wide selection of styles and finishes in our oval range, and also fast and free shipping to most of the UK, making buying your new table quick and easy. The perfect shape to accommodate extra guests, an oval table can be dressed up or down. For a classic look, oval oak tables have a warm and rustic appeal in a natural finish, but for a more elegant take, our dark wood tables are perfect for a contemporary dining room. For a crisp, more futuristic vibe see our oval glass tables or white gloss options, and we also have a wide selection of matching chairs. 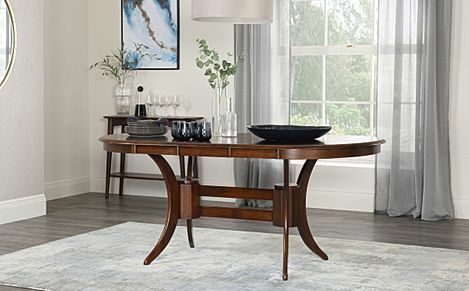 You could also furnish your dining room in one click - one of our handsomely crafted dining table and chairs would complete your home in style. Ordering from our website couldn't be simpler - just pick your preferred table, and select a payment option before choosing a delivery date at checkout.